2003 SSEi had the most liked content! I believe they are different. I thought the exhaust diameter was larger on the 6.2., and the ball connector wouldn't fit. you are going to want a replacement Ball Clamp, your most likely going to have cut the one that is on the truck off. Part numbers or sizes of bumper bolts? I know this is not the typical situation but, I have a local guy that has a 2017 All Terrain SLT with the OEM LED Tails. He likes the look of NON LED Tails better and would like swap with my 2014 Denali Stock Tails. I know GM changed module connectors between the 14-15 and 16+ trucks and the taillight harness is different. I also know I need the Phil G harness or a Gen5DIY to swap into MY truck, but how do I go backwards to make HIS work properly. 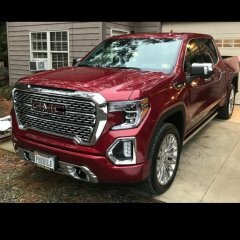 I recently read someone tried to swap a Silverado from the OEM LTZ LED to the Morimoto LED and was having bulb out warnings on the dash and hyper flash. I want to avoid that as I don't want to give the guy im swapping with problems, as he is not mechanically inclined. I'm not sure that I like, that they removed all of the high country badging off the fenders, and the Tailgate...... I get the debadging thing but let the buyer decide?? I wanted to Say thanks to Member @Stephan Stuelp for a great set of Swaybars. Communication was excellent, and he went above and beyond on the packaging. UPS of course mangled the box, but he zip tied all the hardware to the bars so nothing disappeared. I cant say thanks enough, and I am extremely lucky he took the extra effort so all the hardware made the entire journey. THANK YOU!!!! No I was not Implying there is a Kit. I was referring to the Silverado's that are factory equipped with the High Desert Package have nothing complaints with the High Desert Kit. did they happen to have the rest of the door trim in Carbon?